Thinking about houses in the middle of nowhere for the previous post started me thinking about a couple of Peter Doig paintings and in particular what gives them a very different feeling to Michael Raedecker’s landscapes. The most obvious difference is in the time of day depicted; these are daytime scenes which makes for a very different feel. And they’re straightforward paintings, whereas part of the strangeness in Raedecker’s scenes comes from the use of stitch in the paintings. But, of course, it’s more than that. While both artists paint and all the work I’m thinking about clearly counts as painting, Raedecker’s landscapes seem to have some connection with film whereas Doig’s seem related to photography. The light seems somehow photographic here; there’s a flatness to both the light and the image. The unexpected patches of white could be reflected flash perhaps. These paintings lack the menace of Raedecker’s works. As a viewer, I seem to be watching through the trees but more in the way of one who has come across the buildings unexpectedly than of one who has a sinister reason to be there. And the buildings, though they look like they could be abandoned, don’t carry a sense of threat. There is perhaps, though, a sense of the uncanny that comes from the incongruity of the the modernist building encountered through trees. 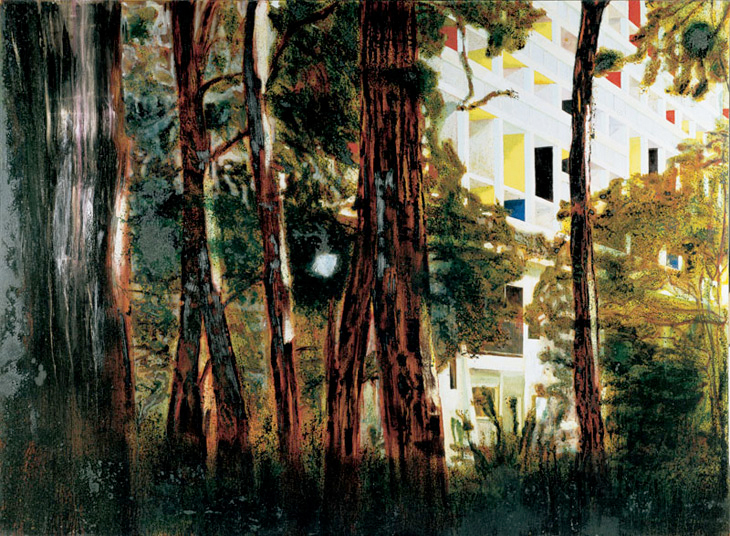 In fact the building in Concrete Cabin is an apartment building designed by Le Courbusier where Doig worked for a time. He apparently recorded the scene with a video camera and worked from stills extracted from his footage. 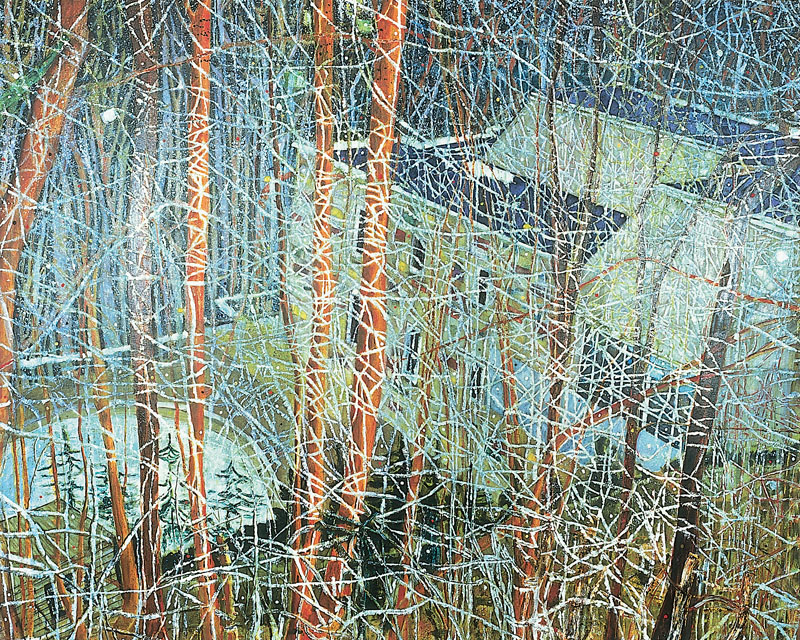 Of all Doig’s paintings*,The Architect’s Home in the Ravine has always seemed the most photographic to me. Rightly or wrongly, I can’t read the lighting on the screen of twigs that blocks out view as anything other than camera flash. Here I feel my presence as observer is perhaps more sinister but this is perhaps dissipated somewhat by the protection the screen of twigs affords the house’s occupants. The house seems cocooned by the twigs. It seems entirely possible that no-one has come or gone in years. * Big claim, no back-up. I can’t begin to claim to have seen all Doig’s work, nor have I researched this post in any meaningful way. But, you know, of the few that come immediately to mind this one seems the most photographic. To me. For no real reason. 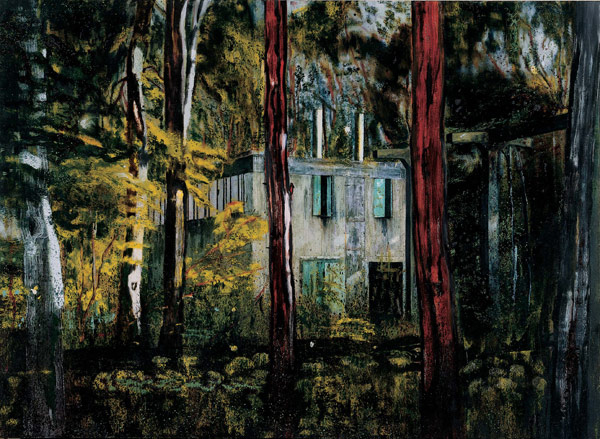 This entry was posted in Painting, Photography and tagged architecture, art, Boiler House, Briey-en-Forêt, Concrete Cabin, landscape, Le Courbusier, painting, Peter Doig, photography, The Architect's Home in the Ravine, Unité d’Habitation by Ann Jones. Bookmark the permalink. Doig is one of my favourite painters. I had not thought of comparing him with Raedecker who has an exhibition in London at present. I shall go and check it out!. The Raedecker exhibition is quite small (inevitable given that it’s a commercial gallery show) but worth seeing, I think. I think some of these were from video stills rather than photographs though which makes my reading of the highlights as flash somewhat improbable but fits absolutely with the very small images thing. The family album aspect is interesting and not something I knew (though it makes perfect sense with some of the paintings). I agree with the idea that there’s a sense of longing; that feels just right as a description.